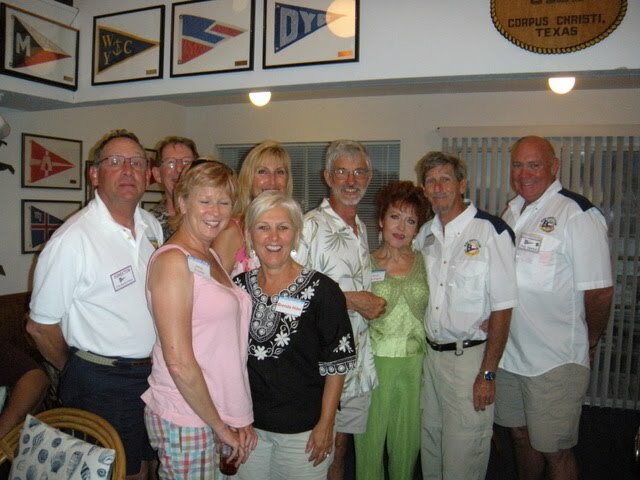 One of the main reasons for joining the BYC bunch and moving our boat from Port Aransas back to the Corpus Christi Marina, is the local racing. I don't know if it's always been this way, and I don't think it has... but BYC is becoming the strongest racing contingent on our Bay. Despite blustery conditions, we had eight boats out for this 12 mile BYC Race. The Saturday Series Races are just a small portion of the many races we do. In past years the MORF group has held the Bay in an iron grip. Cut throat handicaps relegated the "cruising fleet" to clean up the rear of every race. It's not much fun to know that every time out, you're going to lose unless you spend mega-bucks on sails and gear. Many women are hesitant to join such testosterone saturated pursuits. But the times... they are a'changin! Bruce and I are happy to have among our friends, many couples who sail happily together week after week. No yelling... just couples out there sitting the rail... enjoying the racing together. Today's race was a long beat to #4, the weather mark. Our crew sat the high side with Brenda taking the "Sponge" position with no complaints. Steve, Jacque and Mark remained in position close to the cockpit where they could spring into action as we neared the second mark with the pole out to jibe around #10 then beat back to windward to make #19 before turning for home. The girls while away the rail time catching up on the gossip and chit chatting. The men spend their time focusing on tweaking the sails and trying to squeeze every tenth of a knot out of the boat. Now and then the boys have to get stern with us as we giggle. It's hard to keep our minds on the tacks when we have bonding to do. We just keep on getting out there, trying to beat the competition, but congratulating the winners if we don't prevail. There will always be another race... but getting out there having fun and making wonderful memories to relive in my old age are two of my primary goals. Somehow, Bruce and I manage to each get something out of every opportunity to get out there! Today, the winds were in our favor. We made up time on the fleet with only Brigadoon ahead of us at #19. We passed them on the way to the gap to take a first place finish. I hope, as I see the larger numbers of "cruising class" boats competing and fewer of the cut-throats... that change is blowing on these winds. Change where the handicaps are more fair and lend less to encouraging the dropping of cash, and lend more towards EVERYONE with a boat, getting out there! Adagio took second place today and there's not a more "cruiser" boat on the water. They're doing great as they hone their sailing skills in readying themselves for real cruising. There is always the party after the race where the competitors have the opportunity to get together and go over the days events with one another, as only fellow racers can. Good thing about BYC is, every Skipper shares his knowledge with the others in order to bring every one's level of expertise up and leave no one behind.